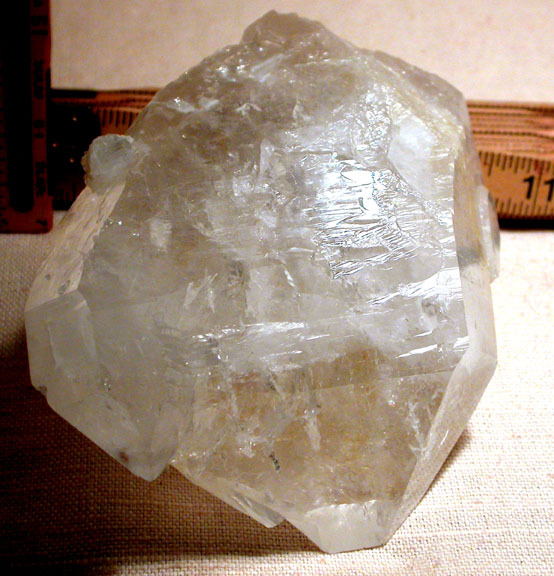 Powerful tabular pale golden healer doubly-terminated skeletal Hera crystal from Arkansas. Perfect 2" growth crater; imperfect old regrowth 2x 2 1/2" and 1x 1/2" on opposite sides. Many technicolor rainbows, including a rare, 1" iris. 5/8" drusy cluster as a penetrator; penetrators and barnacles to 1 1/4". 2 1/4" Isis face; tremendous raised record keepers. 3x 4 3/4x 5+",no damage.